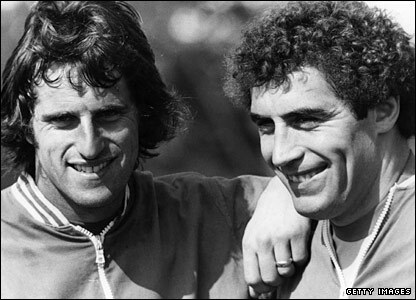 Shilts could use one of those 125 caps right about now, to cover that curly perm. Was there a more tired phrase than "England's Goalkeeper Crisis" leading into and following the 2010 World Cup? In truth, even before Rob Green's howler against the United States, England haven't been in the best of shape between the sticks since David Seaman was in his prime. The emergence of Joe Hart has suggested that better days lie ahead -- but it may never again be as good as it once was. Throughout the 1970s, Ray Clemence of Liverpool and Peter Shilton of Nottingham Forest took turns holding down the England number one shirt. What made their rivalry compelling was that they were more different than similar: Clemence was willowy and easygoing, Shilton burly and intense. Clem played off his line, came for more crosses and, especially, balls over the top, acting as one of the first keeper-sweepers world football had seen. Shilts was more of a line keeper, a shot stopper, but what a shot stopper he was. They maintained their friendly rivalry through the decade, but the balance tipped permanently in Shilton's favor when, in 1982, Ron Greenwood gave him the nod at the World Cup in Spain. Shilton went on to play and play well in the next two World Cups. Even as late as Italia '90, some English observers still considered him the best goalkeeper in the world (though by then he almost certainly wasn't, with the likes of Hans Van Breukelen, Jean-Marie Pfaff, and Rinat Dasaev in their primes). Clemence had retired after injury in 1988. 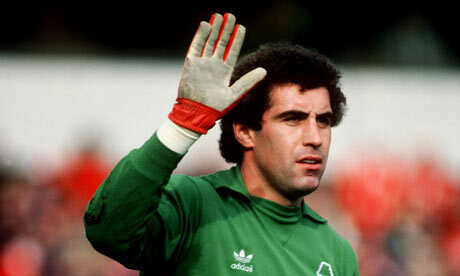 Shilton, then, made the final and lasting impression, and today most casual fans remember him as the better goalkeeper. While he carried on well into his forties with a number of lower-division clubs, chasing (and finally catching) his 1,000th league appearance, Clem immediately joined the Spurs coaching staff upon retirement. He worked his way into the England setup and remains a member of the backroom staff today, though he was replaced as goalkeeper coach by Franco Tancredi in 2007. There is no question that both men were among a small handful of the world's best goalkeepers for years. So what was it that made them stand out? Shilton was a ferocious trainer. In that respect he was ahead of his time, pushing himself on the training ground while most of his teammates were already tucking into their third pint after lunch. There's a story that a German team, in Nottingham for a preseason friendly, stopped by to watch the Forest players go through their paces. The German keeper was invited to take part in the session. Watching Shilton fling himself across his goal again and again, working to the point of collapse, he politely declined. Shilton was motivated by a simple and very clear goal: to be the best goalkeeper in the world. For a long period of the 1970s and early 80s, he may have been just that. Clemence was more sanguine in both personality and style, befitting his responsibilities behind a rock-solid Liverpool back four. He often went long periods of games with nothing to do, then had to make a late save to preserve two crucial points. Wanting to stay involved in games in which he was otherwise only a spectator, he began to position himself further off his line than was the norm for the time, helping popularize the 'sweeper-keeper' role which became common in later years. Despite his lithe frame, he was brave, quick to challenge for crosses in crowded penalty boxes. This was during the era of the "classic" English center forward: the likes of Paul Mariner, Joe Jordan, and Frank Stapleton, big strong men who thrived on balls played into the box. Clemence's agility allowed him to claim crosses without taking a physical battering. Crucially, both Clemence and Shilton challenged for and won everything there was to win in the club game, which meant they were more than ready for the stage of international football. If there's one thing lacking in the current crop of English goalkeepers, it is this. Who among Rob Green, Joe Hart, and Ben Foster has played in the run-in to a league title, or an away leg of a European Cup semifinal? There is a chance, given City's newfound wealth, that Hart could find himself in just such a scenario next season. It would be greatly to England's benefit. The nature of goalkeeping being what it is, they are also both remembered for one giant clanger apiece: Clemence for allowing a tame Kenny Dalglish shot to slip through his legs in an England-Scotland match, and Shilton for diving over a shot from Poland's Jan Domarski in a crucial World Cup qualifier. Such moments haunt every keeper, and Shilton, especially, had to work hard to make people forget his, since it cost England a spot in the 1974 World Cup. It's a testament to his ability and dedication that within a few years of that mistake, he was considered the most valuable member of Forest's consecutive conquests of Europe. Any discussion of the merits of Shilton and Clemence leads to debate. Choosing between them is like choosing between Ferrari and Maserati, but I don't mind admitting that I've always preferred Ray Clemence. Shilton was a phenomenal shot-stopper, among the very best ever, but I found Clem's game just that little bit more complete. I like goalkeepers who come for crosses as a matter of course, reliably and predictably. Though Shilton has a trophy collection any pro would be proud of, Clemence was the most successful goalkeeper of his era. My reasons are also personal, though. I wrote Clem a fan letter when I was a kid, and he promptly wrote back. When you're a kid, it doesn't take much more than that.